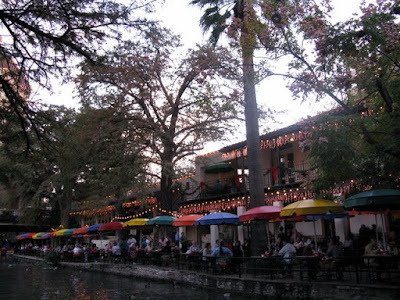 Mention San Antonio, and most people will think of the famous River Walk. We have been fortunate to visit 3 times now, always during the month of December. 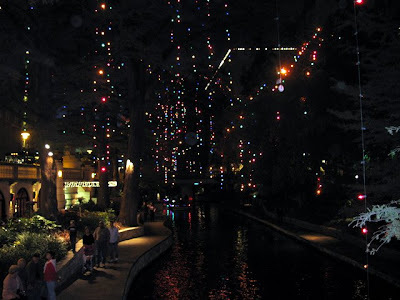 Although a great place to visit at any time of the year (except perhaps when it's drained for cleaning in January) the River Walk becomes magical during the holidays. 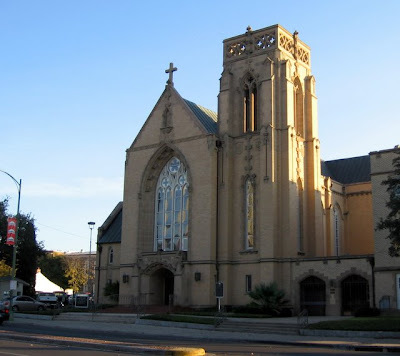 The first thing we do is park at St. John's Lutheran Church. Parking runs either $ 3 or $5 a day, depending on the day of the week. 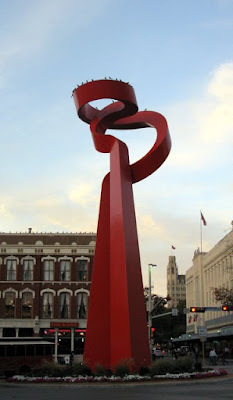 It's very secure and within walking distance to all the sights in downtown San Antonio. 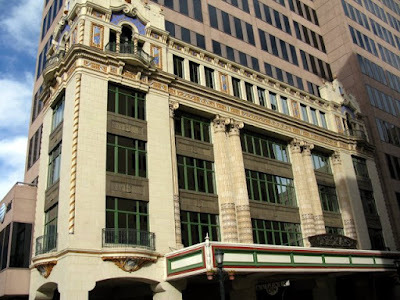 It is directly across the street from La Vallita, home to many interesting shops and art galleries, and just a block or so from the River Walk. 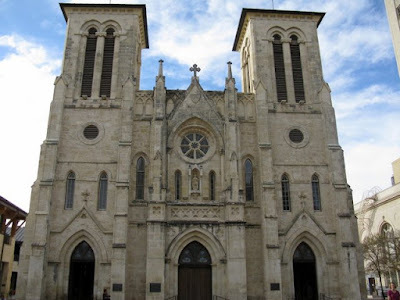 We also pass right along the park with the Cathedral and stop in for a visit. 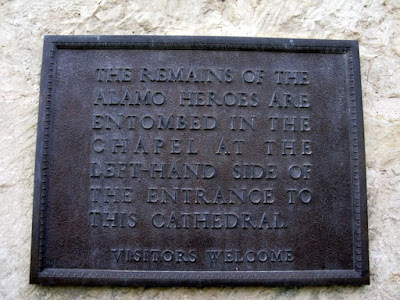 Some of the men who so bravely fought at the Alamo are entombed here. Leaving the cathedral, we walk along the streets to see the wonderful architecture, sculpture, and gardens which make up this city. This year we did not take the water taxis to view the sites, but chose to walk. Truthfully, it's getting harder and harder to stay up late (when it's really pitch black) and enjoy all the sites along the water. 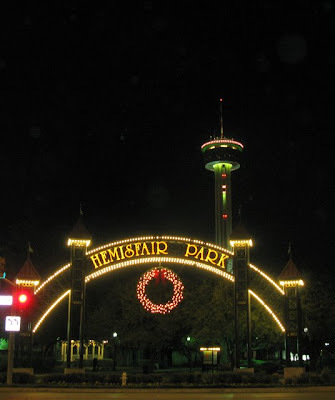 These pictures were taken just after sun down; and without a tripod for a longer exposure, holiday lights were hard to get. I did my best! 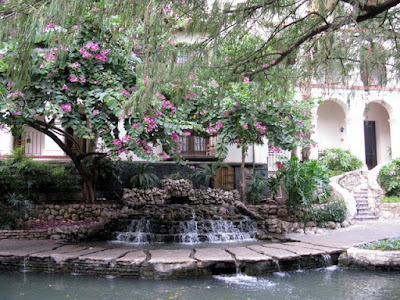 We love the water features, the colorful tables, and all that make up this interesting place. 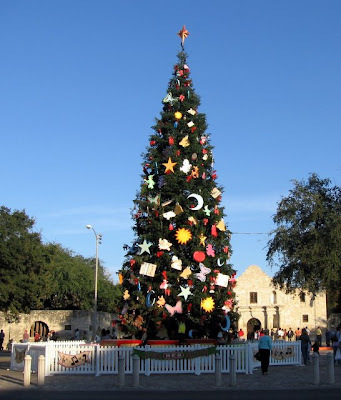 This next picture of a beautifully decorated Christmas tree is in front of a very famous landmark - the Alamo. 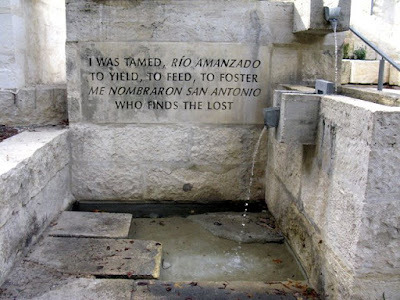 Since we've seen it twice before, we didn't visit again this year, but certainly urge you to visit along with the many missions in the area. We enjoyed them all on previous visits. 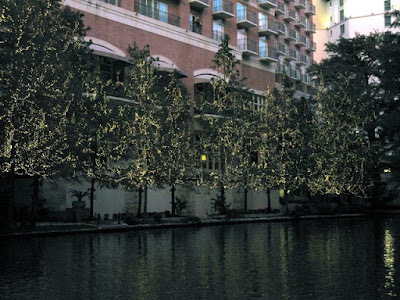 At a jog in the river, there is a beautifully decorated shopping mall. 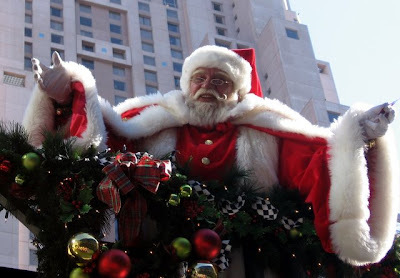 In front, they also have a Christmas tree; but I think you'll agree, that Santa steals the show! Coming next: The Spanish Governor's Mansion.